Several weeks ago I discovered a blogger, who along with her husband, is transforming a ranch house into a French beauty. I love every room that she decorates and she also has a shop full of great items like she displays in her home. This blogger is Cindy at Edith and Evelyn Vintage Interiors. Well, I had to check out her shop and I just happened to order something. It appears to be an old brass lamp base with the wiring removed. I just loved the details of it and new I could use it in my decor. The finish is quite worn so I decided to change it up a bit. I pulled out my French Linen Annie Sloan Chalk Paint® and painted the base color. First coat of paint is already helping the details show up. The gold light is a lamp on in the background. 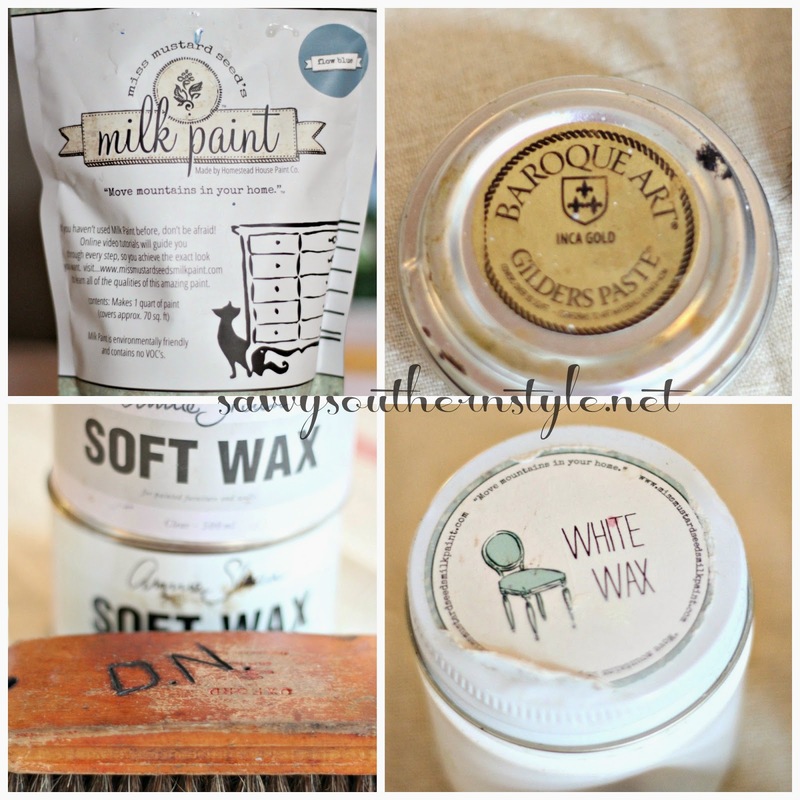 After the base coat of French Linen dried I used some Miss Mustard Seed Milk paint in Flow Blue followed up by some gold Gilder's Paste, clear and dark Annie Sloan waxes, and then some Miss Mustard Seed white wax followed up by buffing with the old shoe brush that Mr. Savvy has owned for years. Well, this post is long enough so I guess y'all will just have to wait to see how it turned out. Yea, that and it was too dark from a rainy day to get the finished shots. Spring begins at 6:45 pm eastern daylight savings time! Post Edit: You can see the final look Here. I love her blog!...and what a great item...and of course you had to transform it ... looks wonderful so far!...Have a great weekend! Can't wait to see it! Looking great! Happy Spring Kim! Kim! Thank you so much for the shout out! I can't wait to see the final reveal of this transformation! Hi Kim, off topic here but when you use chalk paint on a previously waxed finish do you stripy he wax off first? I can't wait to see the finished product. No, Susie, you can use chalk paint right over a waxed piece. Darn it! making is wait to. Seethe finished piece. I love using the baroque gilder's paste for projects. have you tried the paste in slate yet? it relates a wonderful weathered copper patina with a lovely blue tint. have a great weekend! Please, please teach me more about this technique! I have some cranes for my yard and the look you describe sounds like the exact look I'm after! Might not work for outside but must ask? When I discovered her blog, I fell face forward in luv!!! Every room is a new luv story!! Hmm...going to peek at the shop! Can't wait to see your finished piece Kim. I love her blog too! Just ordered a fabulous French enamel pitcher from her...now all I need are flowers! Can't wait to see the finished product! Have a wonderful weekend. I love her blog, too...and she has been a big help when I ask business questions. Your piece looks great! It's lookin' good, can't wait to see it all done and WHERE it'll go! You are a big tease;):) Can't wait for the reveal! Have a great weekend, it is SNOWING here:( I am SO bummed! Well, now you have me on pins and needles! Excited to see how the brass makeover went! I will have to head over to Edith & Evelyn myself to take a look! Happy Friday!! That's a great looking piece! I love how you painted it. I'll have to go check out her shop. Looking pretty! You are always a clever one, Kim.